Renee is a student at St. Francis Xavier University and a reservist in the Canadian Army. She enjoys writing fashion and travel reviews. I first saw the ad for Charmed Aroma Candles on Facebook and was instantly intrigued. I love candles, so that was the first attraction. The second being that they included a mystery ring inside each candle—the value fluctuating from $10 to $5000. I did a bit of research on their Facebook and Instagram profiles, as well as their official website. They seem legit. Many customers posted images or even videos of what they call their "Ring Reveals," when they find and unwrap the package in the wax containing their mystery rings. The company has a large collection of the rings available to view on its website with the estimated values beneath. However, if a customer posts a photo of a ring style that isn't on the website, Charmed Aroma will get back to the customer in a couple of days to inform him or her of its value. Between browsing both their Instagram and Facebook, I saw rings valued from $10 to ones over $200. The value can be seen, as the $10 rings really do look like $10 rings, and the more expensive ones are quite beautiful. The more expensive rings, according to Charmed Aroma, do not come in the candle. Rather, you will receive a serial number, and when you call them to tell them the number, they will ship you the ring. It makes sense, I suppose, not to wrap a diamond in plastic and aluminium foil and shove it into wax. I have yet to come across anyone revealing a serial number. One can guess that these rings are few and far between. So, after contemplation, I decided, based off my love for candles and jewelry, that I would take the leap and order one of their candles. I chose the scent of Emerald Lime. (Their other scents are vanilla, peach, and sweet pea). Before taxes and shipping, the candle was $25. With taxes and shipping, it came to around $35. Charmed Aroma is a Canadian company, and I'm Canadian, so these costs may differ for someone outside of the country. You can just start to see the foil containing the ring becoming visible, right by the label. I placed my order right before Christmas, so I knew it wouldn't arrive quickly. It came in about two and a half weeks, which is not a bad wait considering it was the holidays. I must say I was totally excited while I was waiting, however, so the wait felt long. The candle arrived at my parent's home after I had already gone back to university, so I had to wait until I went home next to open it. It came in a relatively small box with adequate bubble wrap. The candle jar, made out of glass, was intact without any damage. So, shipping was a success. I quickly smelled the candle, and it had a strong, fresh lime scent, which filled the room before it was even lit. My father came into the living room and asked what the good smell was, and was surprised to learn it was the unlit candle. I wasn't the only one who enjoyed the aroma. I trimmed the three wicks and lit it. The smell was fantastic, and the candle itself was aesthetically pleasing when lit. 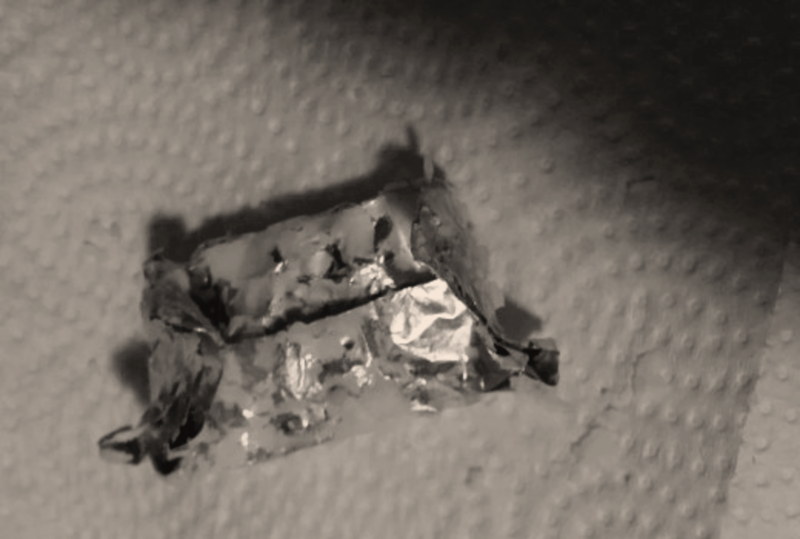 It burned for two to two and a half hours before I was able to see the foil containing my ring. I allowed the wax around it to liquefy before I attempted the removal. Then, I blew out the candle and removed the package quite easily with a butter knife. Be careful of the hot wax. I've seen people remove their packages while their candles were still lit—I wouldn't suggest this as you're looking to get burned. The foil packaging containing the ring. I had paper towel laid out ready for the foil package and let the bit of wax on it cool a bit so I could just peel it off the foil. The foil unwrapped rather easily, and inside, sealed in a tiny plastic bag, was my ring! As I've said before, I did quite a bit of snooping on Charmed Aroma's sites, and so I recognized the style of the ring. It was a crystal "halo" ring and, if I remembered correctly, was one of the more pricey ones. The ring fit my middle finger comfortably. I have fairly tiny fingers, and Charmed Aroma randomizes their ring sizes with the most common sizes (6, 7, 8). Judging that the ring fit on my largest finger, I'm guessing it's a size 7 1/2 - 8. It is beautiful! I took my picture for Instagram and Facebook and went on its website to see the value. It appeared that the ring is cubic zirconia with rhodium plating, valued at $80. Not bad for a $25 candle! The ring has got me many compliments and at first seemed to be of good quality. For the first few wears, it retained its shine well and didn't turn my finger green. The ring! Ignore my ugly hands—I'm in the army. The Quality of the Ring: Was It a Good Value? Unfortunately, after wearing the ring for some time, it did begin to turn my finger green. Whether or not washing my hands accelerated this process, I was disappointed. For what they said the ring was worth, I wouldn't have expected for that to happen. Of course, there's the fix of coating any jewellery like that with clear nail polish, but personally I don't see the point. I wear three rings every day; two are gold and one is silver. I don't want a ring turning my finger green. It looks terrible, and it's a sign that what you're wearing is cheap. It makes me question the actual supposed value of the rings that Charmed Aroma advertises on their webpage. However, I'm aware they have a large collection of rings that are made of different materials. This ring was beautiful until it began to tarnish. I haven't really worn it since. The process of Charmed Aroma is exciting, but from now on if I want a candle, I'll buy a normal one—and I'll stick to jewellery that doesn't turn my skin green. 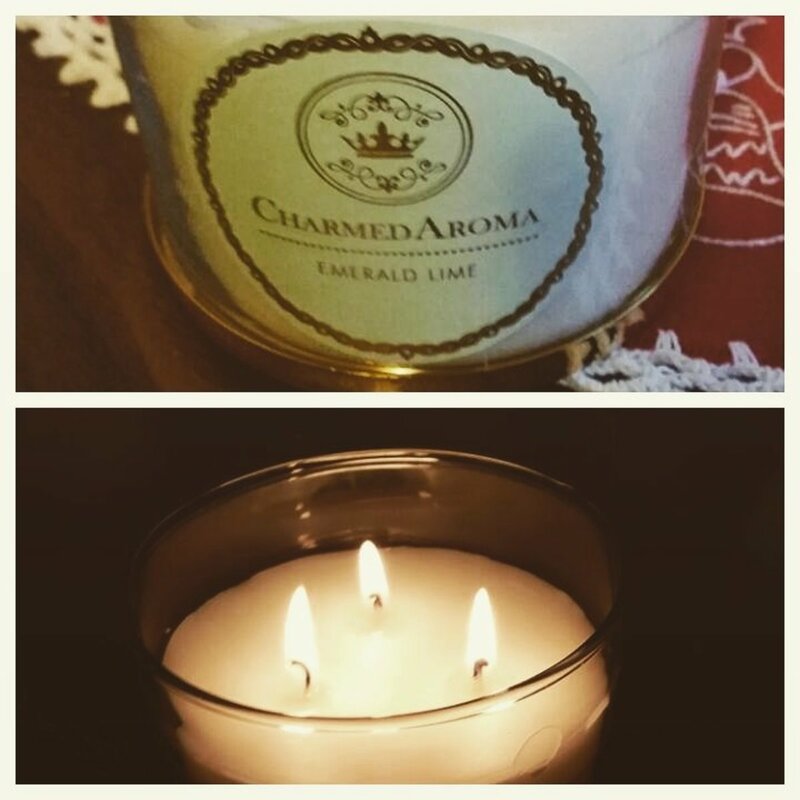 Would you buy a candle from Charmed Aroma? I've bought 4 hidden gem 2 rings in each candle and everytime they were 25$ and both rings are the same color different shape but both worth the exact same amount. Disappointed when you spend 40 on 1 candle, guess i just hoped one would be worth something. Im sure they have expensives ones but its probably 1000/1 ratio. Better to take that 40 bucks and play thr lottery! Be aware :( I sent a message asking for the same candle to be sent in its place bit haven't heard anything. I found a ring and a necklace in my Sweater Westher candle. Love the scent and the jewelry is very pretty. Did not know that they had necklaces as well as rings. Value was $130. Hope that is a true evaluation. I had bad experience with charmed aroma jewelry. My ring was worth $30 but when you looked at it, it was cheap and not even worth $5. The candle smelled good. Not sure I will buy from them again. I’m guessing it all depends on the ring u get because I have 3 rings that I wear to work and wash dishes with that never tarnish. However I have heard many people having bad experiences. I would try again if I was you and wait till they have 19.99 sales on their candles. Strange it turned your finger green. I have very sensitive skin and never had that problem with any Charmed Aroma jewelry. Mind you, the rose gold will fade to silver with time, which was upsetting. Also, they sent me the wrong size ring the last time I ordered. Their customer service was beyond amazing. They sent me a replacement ring within days (which was worth more than the original, and I got to keep both!). Hello again! I treated myself to 14 candles 2 weeks ago. Since then I've been burning them all over the house, they smell so good! So far I've gotten a $75 ring, $90 ring, $150 ring, $150 ring and last night I got another ring! This one was valued at $200! I would love to get a gold ring, but I'm not sure if they have them. I think the gold ones are the big prize winners. I give them to my kids and friends. I love their candles and plan on buying them forever! Wish me luck on the rest of them! Thanks, Lynn. I'm so excited!!! I haven't bought any candles because money has been tight. But last time I got beautiful rings! The were valued between $100 to 250! So figures crossed! I have peachy Bellini burning now, the whole house smells so yummy! Wish me luck! I've literally bought dozens of these for myself and family. Never had a problem with the company or the rings, none of them have tarnished and none of them have turned my fingers odd colours. As someone said though, what are you expecting? Want good quality jewelry, go buy the real deal then. I have purchased 3 candles very close together. Before you could choose the size. Well my rings were to big so I tucked them in my jewelry box that keeps ring from tarnishing? I went back to choose a ring to wear about 6 months later to find the one that was $85.00 was black. The other two were cheaper and starting to turn. Note my sliver and gold that I bought and chose on my own are perfect. Can't imagine how fast they would have turned while wearing. I have purchased several candles and a few bath bombs. I have received some very pretty rings and earrings it's fun, like a kinder egg for grown up kids! However 3 of the items were not so great. 1 ring I gave as a gift, DID turn my daughter in laws finger green. Then black. Ring lost it's shine and after a good cleaning it's very hard to photograph how bad the '925silver' looks after wearing for a month. Its pitted and dull and now I feel very bad giving it as a gift. Haven't tried to return that one yet. 1 ring lost a stone fairly quickly, that one was replaced quickly without any issue, very great policy regarding returns. If you can get a good photo. It's a hit and miss with cheap silver jewelry. Still fun still worth ordering again. Never know you might just reveal those truly expensive ones! I mean, what company who is striving for profit would actually give away real rings. Cute gift for a young girl though as a novelty item. The candle smells good but the whole ring scam to entice people to buy candles smells bad. Bobcat OUT! 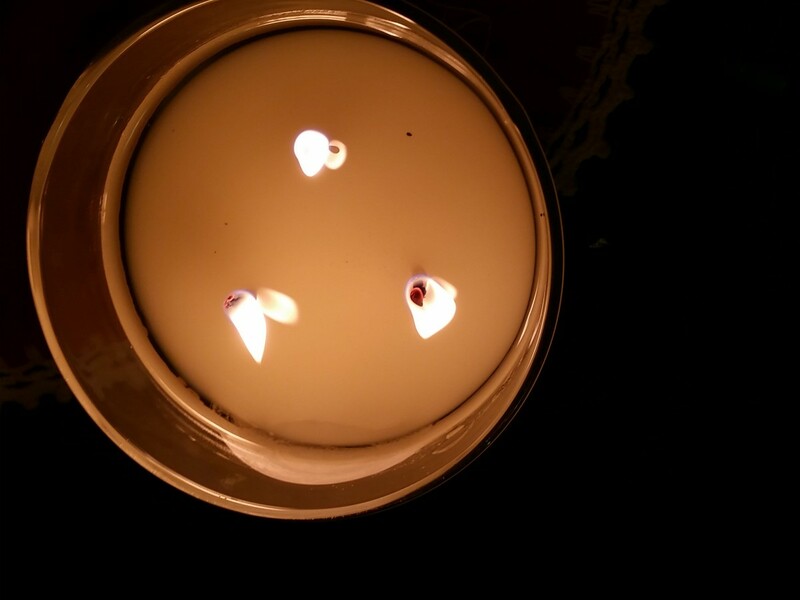 Bought my first candle and my son bought one for his girlfriend for valentine's day gift. I was so excited to get our candles. They shipped quickly. My candle smells great. It couldn't burn fast enough to get my ring. I received a $60 ring. It's a game of chance. I loved it and will order again! Fun and great gift ideas! The ring was a true fit too. I got a limited edition Swarovski vanilla macaroon candle for Christmas. My ring revealed was beautiful and upon close inspection bore the 925 symbol of sterling silver, valued at $150. It may be an elevated cost, but it is silver, the candle is beautiful and like a lottery ticket - I loved the suspense of what my reveal would be. I'm getting one for everyone this year! I received my order. It doesn't look like on their website at all. It is so cheap looking. Will never order again. This is ridiculous, this morning your advertisement said this promo was for all products. When i emailed you this morning i received a swift response (within 15minutes) stating it was only candles. I then replied with proof (photos) that it said All products. A few minutes later all adevertisement was changed to candles only but I am still waiting for an answer to resolve this matter.This is faulty advertisement and it is illigal. I will not stand for such marketing tactics. I love your products and have refered numerous people to your site. I am disappointed and disgusted but your customer service! Shame on you! I will take the necessary action to resolve this issue. Rhodium is a precious metal, a member of the platinum family. Rhodium electroplating is used, especially on jewelry, to provide a surface that will resist scratches and tarnish, and give a white, reflective appearance. Rhodium plating is most often found on white gold. I got a Hidden Gems Candle as a gift. I was able to pick out the candle & smell I wanted I was there when it was bought. I felt like it was a waste of money and that I wouldn't get much more than a $10 ring...I almost told him to put it back. I pulled out a 18K rose gold diamond & yellow tourmaline ring worth 1,350!! for real. Bought the candle at a store in the mall on sale 29.99 in NB, Canada. Not bad for a $30 candle!! I WOULD suggest Hidden Gems & my ring is beautiful, in fact I have NOT taken it off other than to show it off. What do you think you where getting? It is what psychologists call it anticipation the thrill of the hunt hell get another one we know you want to HA! Personally, I wouldn't be completely deterred by the quality of the piece of jewellery as the price for the candles and bath bombs isn't a ridiculous amount that I would expect better. It's like a nice added gift to the product that I think would be fun. I have now purchased 3 things from them, 2 candles and a bath bomb. All lovely scents, I plan to buy a few more of each over the next little while. I love candles, and pretty jewelry is just a plus. All 3 rings have been valued at $150. The first was a size 7, and came with a gem ring, and a band. The band fits perfect, but the gem ring was a little tight for both being the same size. The next time i ordered I ordered a size 8 candle and a 7 bath bomb and the 7 fits much better than the first and the 8 fits my middle finger perfectly as well. Although beautiful, the size 8 ring from the July birthstone candle is a little clunky, and looks more like costume jewelry, but I still love it. Cant wait to buy more. I have had no issues with charmed aroma. I got 3 rings that were $30-$80 and any from $100 to $250. Now they are all Sterling silver and you can buy your size except the Champaign one. It's Sterling with random size. Also as for coustermer service I have delt with them fur to an issue and they sent me a new candle. Another time I didn't get the free promo necklace so they sent it separately. So no issues with them at all. I say try it and if you have issues try being civil with them and you will be treated as a valued customer. You can actually still choose the size!! I got 5 candles and chose size 5 because I have very skinny fingers - they worked out perfectly for me!! I got an email regarding the flash sale of buy 3 candles get 2 free so I purchased 3 an was expecting to get 5 sent to me which was not the case , I only received the 3 that I paid for so I called customer service to find out why an was given the answer of we're sorry but the sale has ended an we will not be honouring that promotion anymore I then told them at the time I made the order the sale was still on the website an they still refuse to honour my request I'm just asking the public if they think this is proper customer service ? I just used one of your bath bomb this morning and I like the bath bomb but I do not wear a size 10 ring wear a size 8 ring and it is a crown and I am wounding what you are going to do about that. You used to be able to choose the size when u ordered. This was years ago though. I bought two rings: one from the body butter was $200and one from a bath bomb was $150z. I really like my rings a lot. I wear them everyday and get lots of looks and compliments. They are sturdy rings and I plan to buy a few more. Received my candle in 1week after ordering which isn't too bad but I ordered a size 8 and got a size 9 which is too big for my fingers. I even went back to my order form and yes it says size 8. Very disappointing for my first order. Not sure if I will order again. You should have your rings independently appraised rather than depend on the appraisal from the company you acquired the candles from. Then you would know their true value. I tried to return products due to finding out rings are fake. The candles burn way too fast. I sent multiple emails requesting to return products, at least 5 emails, I never received a single reply to return and get a refund. When I emailed several times about invalid appraisal codes it took months to get one code appraisal. The other codes I never got. I wont be purchasing from charmed aroma again. They are way overpriced, fake jewellery, terrible customer service, awful response time, and their candles burn too fast. Simply put, overhyped and overpriced. I will make sure everyone knows. Thank you so much for sharing. My skin is incredibly sensitive to metal alloys so this was really helpful! The ring I received was cheap looking; I thought it would be sterling silver and yet it is a yellow gold color. I knew it was going to be a gamble, but it is still disappointing to not like my ring. You're ring looks like the angelic Swarovski ring which is rhodium plated and should be taken off when you wash your hands. If the ring was actually sterling silver it shouldn't have turned your finger green. Sterling silver doesn't do that when worn, not matter how long or short of a time you where it. Personally I wonder how the company can stay afloat selling candles that are far cheaper than the $50-$200 rings or more. If they actually cost as much as they said they probably would be losing enough money to be out of business. Ok these candles really do make the house smell nice, but lot all people have size 6 fingers. Out of 5 candles most of the rings are small. Not happy about this. I've purchased a few of these candles because they leave my rooms with an awesome aroma. They are attractive candles, I love the scents and the prices are not bad at all. You can pay from $26 to about $70 for candles, if you are are so lucky to get an expensive ring in your candle (yeah for you) but if it's the jewelry you are buy it for then go to a jewelry store. To feel "ripped off" because you bought a candle because you heard they smell really nice and make your home smell nice and then complain because you didn't get an expensive ring in your $26 candle is a head shaker. Candle store vs Jewelry store. 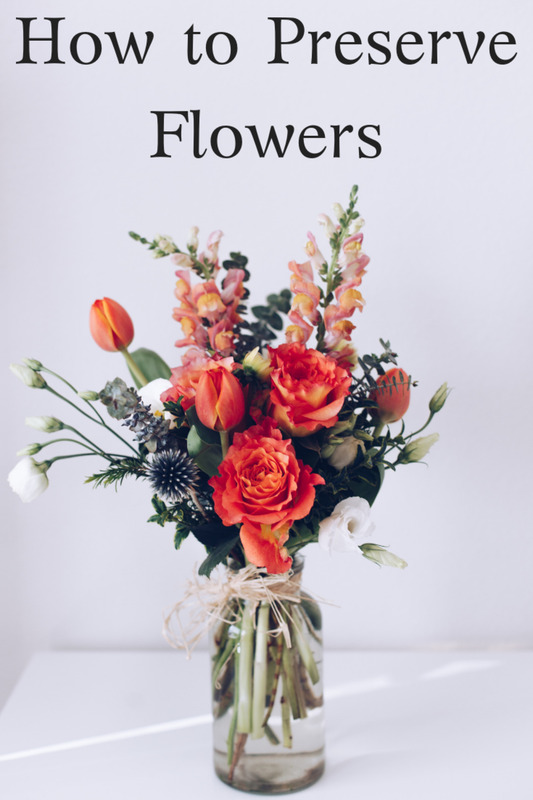 The fact that you have a chance to win a beautiful expensive piece for jewelry should be incentive enough, and in the meantime, sit back, relax and enjoy the the aroma in your home. Each individual has its own decision. Somebody like Earrings, Rings, Bracelets. Be that as it may, i like Diamond Jewelry most. I think accessory with little pendant and little studs are the best gems for all. In some cases platinum or white gold rings likewise look great. I bought a sterling ring size candle and received a $200 ring but after a week of wearing it a bunch of the stones fell out! When I contacted them, they said they would replace it with a new ring. It took two months of me asking for a tracking number and whether or not it had been shipped until it finally arrived. Before it arrived I had contacted them saying I still had not received it and they said they would authorize another ring. When I opened the package that contained my new ring, IT WAS MISSING STONES ALREADY! According to the online appraisal my new ring was work $150 supposedly. The ring is beautiful but it was defective. I am so frusterated with the quality of the company. If I had known how crappy the rings were I never would have bought one of their candles. I would have gone to Bath and Body works and bought a better smelling candle for way less money. I will never buy from them ever again. I just wrote a comment but after reviewing everybody else's I guess I'm one of th lucky ones that had fantastic service! They had a special, buy 3 get 2 free. They were the 3 wink ones in a silver fancy kinda bowl with a lid. I also ordered 2, 2 wink candles. So I had a total of 7 rings, 5 rings were worth $150.00 and 2 were worth $200.00! Then before Christmas I ordered myself 4 two wick candles. I burned one last night and took the candle out. It was worth $250.00! I still have 3 so I'm keeping my fingers crossed that I get one with just a code in it. I know I'm dreaming but you never know! Wish everybody had great service like I did! I love these candles, they smell so good! And the chance to win a $5000.00 ring is so exciting! I ordered 2 Charmed Aroma Candles on December 2, 2016. No warning of delays in my order, actually no email to me. I inquire after 2 weeks of hearing and receiving nothing. This is when they say to me that they were not sure where to ship my order, even though in the order process it clearly has a shipping address and a billing address. Then hear nothing until I email again and again and again...with no responses to me at all...advising anything. Finally I get a credit to my account with no explanation. I email and ask what this is for and they advise Dec 28/16 that I am only receiving 1 candle. I get a "sorry we are busy" email. No compensation or discount on my next order...So I have cancelled with them and will NEVER order a candle from Charmed Aroma again. Charmed they are not! it's all about being gullible. seriously...think about it....the price of the candle yet they will give away hundreds of dollar rings in it? wouldnt they go out of business in short period of time? you get what you pay for...cheap! and try to be less gullible in life! I had ordered from charmed aroma and got a confirmation email saying the package was already delivered after the fact, but i never did recieve my package. I tried emailing them and it takes FOREVER for them to response back and when they did response back they asked me to check my mail box. OF course i did check it before i had email them. I am still waiting for their response after i sent another email. They have HORRIBLE customer service. I will NEVER shop from then EVER AGIAN. You should check our Royal Canadian Candles. Located in Brantford Ontario. Www.royalcanadiancandles.com. They are 1000 times better than charmed. Charmed uses soy blend with parafin. Royal uses 100% soy. Also Royal Canadian candles allow you to select ring sizes and their jewellery is sterling silver that won't turn your finger green. Yes charmed has a office in Canada but they are an American company. I ordered my candle on November 28 - received this week. I orderd $128, 3 candles on Nov 25 2016. The payment was taken off my credit card that day. I received an order confirmation email. I haven't heard from them since, or received my order. I have sent an email every week since asking for an tracking number or if my order was even shipped. I get an automatic email response that says we are currently receiveing high volume of emails & calls. Our response time is delayed. We will get back to you. I couldn't find a phone number for them. Yesterday I called my credit card company to send in a request. I know a few people who have ordered these candles, thought they would make a great Christmas gift. Now with 9 days left I have to find 3 gifts for 3 teenagers. I am so not happy, disappointed. I would not order from here again. For what it's worth we ordered on Nov 27 or 28th, received an email stating every order placed before Nov 29th would be delivered before Christmas and order arrived yesterday Dec 14th ! Well packaged and all there so I have no complaints. Never did received a tracing number. These are just rings from china. You can buy the exact ones on Aliexpress for $2 to $10. I have a problem with the company passing these rings off as expensive rings. If you dont believe me check out aliexpress for yourself. Placed an order November 27. No response to multiple emails. Thoroughly disgusted with this company. Would not recommend to anyone. No idea what product is like but customer service pathetic. I wish Charmed Aroma would turn on the review button for their FB page so they could more efficiently deal with customer concerns. I placed two orders with them, one on November 23rd and another on November 28th, 2016. I am still waiting for a response and for my items to be delivered. Below is what I posted to their Facebook page, sent in a private message as well as by email to them. Beware of this company and their lack of customer service!! Report them to the BBB if they have taken your money on the promise that you will have your items within 4-5 business days, as promised to me and so may others OVER A MONTH AGO. THEY EVEN SEND OUT FAKE TRACKING NUMBERS. A shipping label has been created by the shipper. Once the shipment arrives in our facility, tracking status and the expected delivery date will be updated. Check back for updates or sign up for email notifications. So much for getting my Christmas gifts shipped over seas in time. That is, if I ever receive them myself! I don't care how great this product may be, I or anyone I know WON'T EVER purchase from them again. I'm quite upset as you can tell, but after spending $600 bucks on Charmed Aroma products as Christmas gifts, not receiving them and no customer support to answer my inquiries ( yet they can post often on FB, Twitter etc. ), I am starting to think I've been taken. Does anyone else know of another course of action a person can take to resolve these issues and get your money back if the items never come? I also see ring codes missing, stones falling out, and complaints on the lack of customer service. I hope instead of deleting this message, Charmed Aroma will address this with true sincerity, honesty and regret, and not in their usual generic manner. I posted this after trying to contact them several times, and they deleted it as well as everyone else's complaints, plus blocked me. For the time, effort and money I've put into this, I could have bought the wax and a cheap ring and done it all myself. Buyer beware!! I have ordered several candles. 3 are valued at $150 to $169. Love the smell and the fact they burn to almost nothing. Haven't had any problems with the rings or service. Have ordered from Canada and now in the USA. Have got my orders within two weeks. Am very pleased and continue to order. I am having a similar issue with the order that I placed on Nov 24th. Payment hit my credit card right away but no confirmation of shipment. I have sent three emails and have had no response from them other than to say that they received my email and would get back to me. I am now very concerned that these will not be received before the holidays yet they were bought as gifts. Have bought from them before but this is enough to turn me off of future purchases. Still have not received an email or anything and I ordered on Nov 25. Ive been emailing to see what is going on with the order!!!!! I focused on buying the product not what was inside. I love the smells and the cream. That's what I paid for and I am satisfied with them. I just received my candle today. It only took 2 weeks. The candle smells amazing, and after 4 hours of burning , I dug out the foil, eagerly unwrapped and inside was a gorgeous marquis amythist necklace valued at 129$! I will definitely order again !! Gave a candle to a girlfriend for her birthday , her ring was Damaged, since September I have been trying to get a hold of this people, first of all, no one returns calls it's all through emails, they keep saying 1-3 weeks over two months have passed by, no ring, not a returned call from a manager like i requested multiple times on my emails. Worse customer service, bunch of liers ,they are pretty fast to ship when you buy , wait till you have a problem and nothing gets resolved. I stop buying from them despite have ordering over $1000.00 worth in candles over the past year. Caution ... do not order these products. I ordered a size 5 ring size candle and was sent a size 8 ring inside instead. I contacted customer service and they said they would mail me a replacement ring but that the value would be random (not necessarily the value of the size 8 ring I received). This happened back in August 2016 ... it is now November 2nd 2016 and I have STILL NOT received my size 5 sterling silver replacement ring - even though customer care has supposedly mailed it to me twice . I have not received any replacement ring AND they made me ship back the size 8 ring to them before processing the exchange ... so now I am even worse off as I have no ring at all. also customer service does not offer any tracking information when replacing an incorrect item. I will not be ordering from this company again. Long story short got a ring that was supposed to be worth $70 went to get a second opinion not worth a penny. All that excitement for nothing! Bought bath bombs and candles love both of them. Bath bombs have Sterling silver rings so no 5000.00 rings but way cheaper. My ring from bath bomb 200.00 and it's beautiful ,same with candle. People need to remember your buying the candle and focus on that. It's like kinder eggs for adults. I am buying many more bath bomb as I was very happy with the quality and it was fun. We all could use this in our lives. I thought the candle was well worth the money alone as a candle, as was bath bombs so the prize is just a bonus. Good luck to all waiting on them. thankyou for letting me know that the ring eventually started to wear down, I don't believe the ring could actually be worth 80$. great review! thankyou! My ring was appraised by their website at $90.00 within a short period of time it started to tarnish. This is crazy, a $90.00 ring shouldn't tarnish. I am not opposed to costume jewelry but what bothers me is them saying it is worth $90.00 when it clearly is not. Re: Jenna saying 925 is a Walmart "brand"
925 is the stamp signifiying that the metal is sterling silver. "Sterling silver is an alloy of silver containing 92.5% by weight of silver and 7.5% by weight of other metals, usually copper. The sterling silver standard has a minimum millesimal fineness of 925." I'm still waiting for my candle. Ordered it in the begining of June we are on in August,& it is for my daughter 's birthday on the 21. I sure hope it comes by then!!! Not to say that is a bad thing, but would give hint that the ring is not worth more than $50.00. IF you look through the Walmart online jewelry, you'll see a remarkable resemblance in the rings. 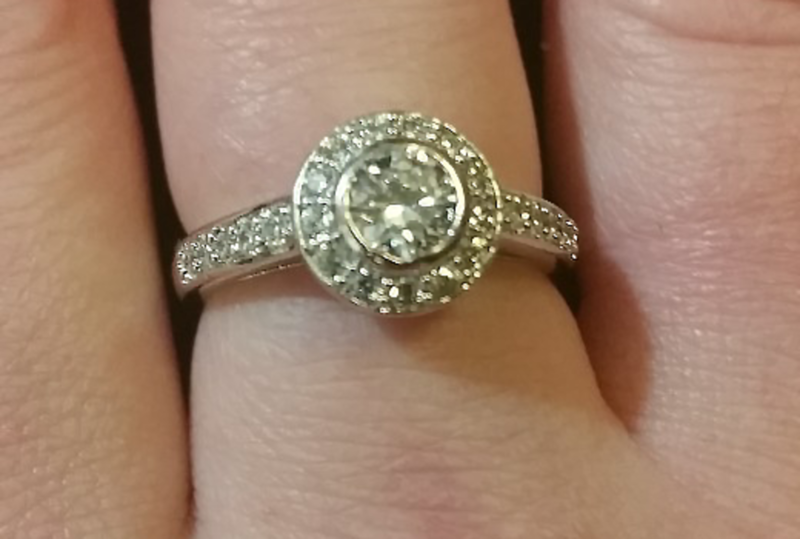 It was fun to receive my purchase from Charm Aroma and dig out my ring.. Their site said it was worth $200.00, but I'm not taking it into the pawn shop for a pay out that's for sure. Its fun and exciting. The Grapefruit soap smells DEVINE! take it for what it is. lol But I would defiantly contact them about quality control if the ring tarnishes quickly. I won't lie, I'm not entirely convinced that this is the true value, but I'm pleased with it and as the article says it's a pretty cool process. Getting error message when trying to input? I just retrieved two rings from the two candles I received from Charmed Aroma. 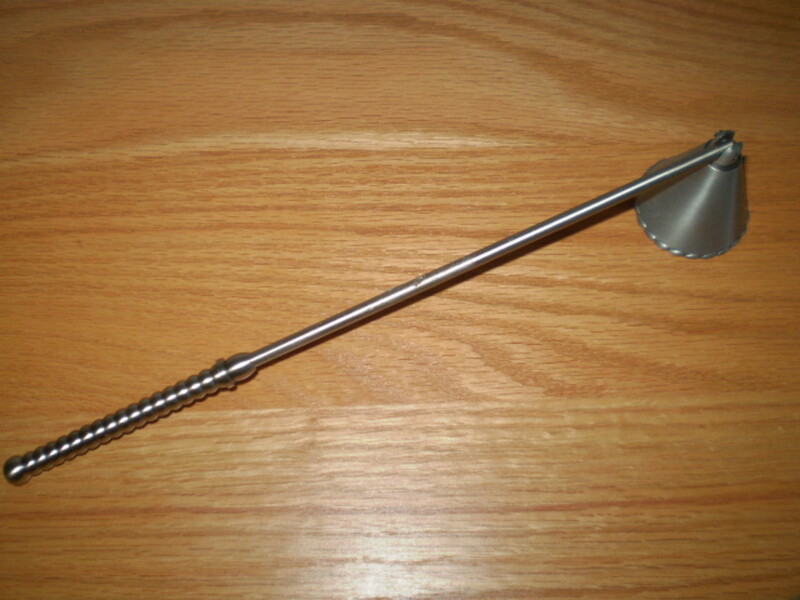 The first one is elegant, very pretty, and stamped 925. I was too impatient, so I think the code tag is still in the candle with some of the foil. The second, pretty, but not 925, and worth 50$, whatever. I didn't expect anything more , so I am not disappointed, and, a candle-holic, love the candles! The hidden rings are like a bonus lottery, except you do win something, every single time. If anything, it's entertaining, and smells lovely! has anyone ordered the more expensive candle? I got the 50 dollar one and haven't met or talked to anyone else who purchased it. If you have please message me with how it went and what you received! Loved the concept and was extremely excited but held off for several months before I decided, screw it, just get a couple. If anything I'd be left with a nice candle. There are several pictures on the website of all the different rings and apparently the people who post their pictures are just the ones who recieved gorgeous rings. When I was looking at all the pictures I loved all the pictures I was seeing. Me falling for it, thought I'd receive rings like the pictures, therefore I ordered three candles. Shipping was great, came in an amazing amount of time. When I opened the box two of the candles were broken and the other one was missing a lid. As I was boring them I was extremely impatient and excited because I am a ring finatic and could barely wait. After waiting three hours and still seeing nothing a started digging..I finally found all three.. Number 1 was not bad looking, appraised at $80 and fit perfect. Wasn't exactly my taste but, still a nice ring. Number 2 is absolutely hideous! Looked it up and worth $80, again. The bag was ripped so there was a bit of wax on the ring so i ran it gently under some water and the cheap red centre stone fell out and went directly down the drain! Last candle..my hopes were really high because of all that had already happened. Start opening the foil, couldn't really see the ring through the bag, snipped the bag open and dropped the ring out. I appraised in my head thinking is there an option for the rings to be worth $1 because that is what this one is worth. Was the cheapest, ugliest ring I have ever set eyes on. Appraised it, $40. Hugely disappointment and now all I was left with was okay smelling candles and a mess! A family friend of mine who custom made my engagement ring also appraises jewelry. For fun when he was over I inquired how much he would appraise them for. He looked at all three and said $20 after. In my head I'm thinking $20 each, not bad considering. Nope! $20 for all three combined and the only reason $20 because of the metal for first ring. Who the f*** do they have appraising these rings? All three, I gave to my 4 year old daughter in her jewelry box. Not even tasteful enough to wear as costume jewelry. Omg you guys!! They are beautiful smelling, long lasting quality candles. It's exciting to get the ring, yes, but I've paid more for jar candles without rings. It's fun, and different, and obviously not for everyone, if you are expecting to buy a $25 candle ( great price), and get a diamond ring, perhaps you shouldn't be spending your money this way! 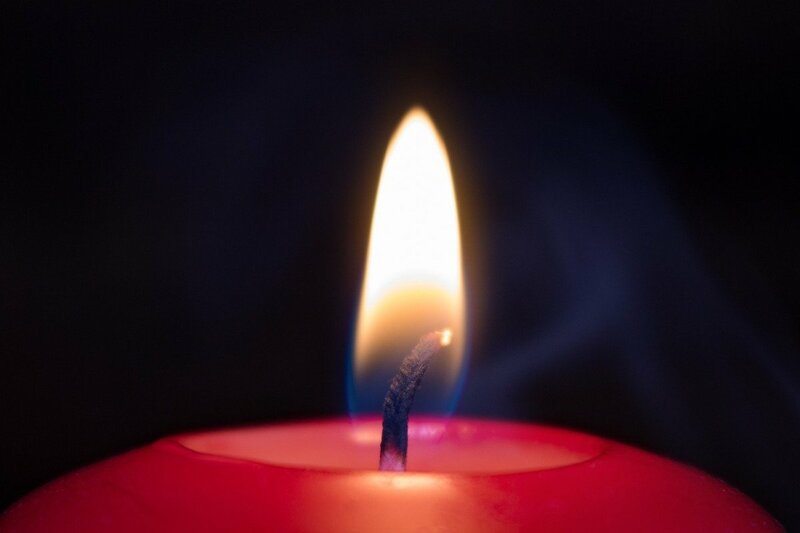 If you can't afford to buy the candle, without hoping to recoup your money through the ring.......move on. These are like " surprise bags" for adults....does anyone ever remembering getting anything extrodinarly expensive in a surprise bag as a kid.....no, but it was so fun opening it! I love these candles, and don't even wear the rings, just collect them, in a drawer for the kids to play with, Im going to make another order right now! Lol, enjoy them the way you should, as candles with a surprise ! When the rhodium plating wears out, your finger might turn green when wearing it. If you really like the ring, get it replated for $35. I purchased a charmed aroma candle and was very disappointed in the ring j received. It was appraised at $30 but looks like cheap costume jewelry not worth more than $10. I paid more for the candle and will not be buying these particular candles again.